It is an open secret that wealthy people may often sign their money over to their pets leaving close relatives with nothing. Michael Jackson’s pet chimpanzee Bubbles has become the richest chimp in the world after the pop idol had signed $2 million away to Bubbles. Jackson’s relatives said that Bubbles had his own bed, that he would sit at one table with the pop star and that the chimp could even use his private toilet. London-based antiquarian Ben Rea left $15 million to one of his 15 cats that would overlive other 14 cats, which the millionaire had. Ben Rea once said that he felt at ease only in the company of hid cats. The lucky cat that inherited all the money was Blackie. 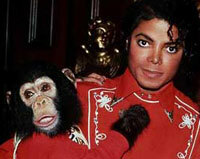 It was not only Michael Jackson who loved apes so much to leave them a lot of money. An old lonesome woman from Copenhagen left all her fortune to six chimpanzees from a local zoo. Gunther IV is considered the world’s richest dog. His dad, Gunther III, was bequeathed a $65 million trust in 1992 when their owner, Countess Karlotta Lieberstein passed away. Since inheriting his former mistresses’ millions, Gunther III has passed on his fortune and legacy to his son Gunther IV. Gunther had his own BMW cabriolet, a driver, a cook and servants. Recently Gunther’s trustees have bought Madonna’s old Miami mansion. Nowadays a well-known “Gunther Group” empire prospers due to Gunther’s trustees’ efforts. The dog’s fortune is evaluated at $290 million. British millionaire Miles Blackswell has no direct heir as his wife died in 1999, that’s why the man decided to make his favourite hen rich. The hen will inherit about $17 million after her master’s death. Parrot Tsuki (£ 50, 000) and many others.